Beautiful satin walnut finish decorative music rack. Rich tone and even touch. Reconditioned by a Registered Piano Technician. The Acrosonic pianos are well known for being high quality instruments, and the musician's piano choice for a fine piano. 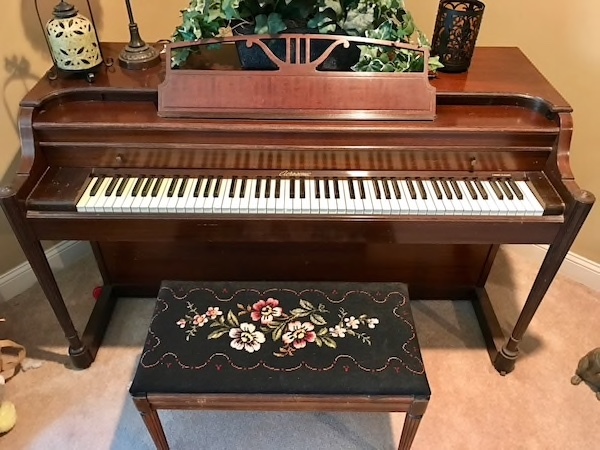 Perfect for a musician who needs a piano for a while, a college student, or as a starter piano to see if your child will take to lessons. Comes with a matching, padded bench that opens up for music and a free tuning.